On tour with Likud Anglos, Hotovely discusses the plan she intends to bring to the Knesset that will expand Jerusalem’s municipal borders. 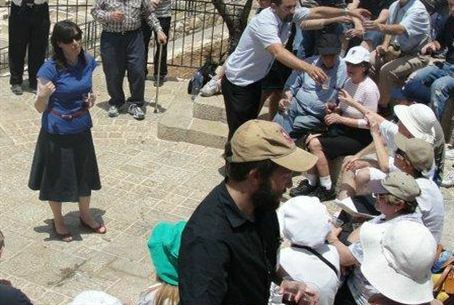 Standing at the site of King Hussein’s unfinished palace in east Jerusalem, MK Tzipi Hotovely (Likud) told approximately 140 English-speaking Israelis on a a tour of east Jerusalem organized by Likud Anglos, that Jerusalem needs to be built up and its borders must be expanded. The MK also discussed how the media use of Arabic names for various Jerusalem neighborhoods gives people the impression that these are not Jewish neighborhoods, and can therefore be easily handed over. In fact, Hotovely noted, Jewish and Arab neighborhoods are often only a few meters apart. Hotovely said she plans to introduce legislation in the Knesset this session that would create a “Greater Jerusalem” metropolitan area by expanding Jerusalem’s municipal borders to include places such as Ma’aleh Adumim and Giv’at Ze’ev. Hotovely pointed to undeveloped areas and hills as examples of land that should be incorporated into Jerusalem’s municipal borders and then developed as part of the city. In this interview Rabin decried the establishment of a Palestinian state as a danger to Israel. Introducing Hotovely, Daniel Tauber, chairman of the Likud Anglos Jerusalem Chapter, noted the danger a Palestinian state would pose to Jerusalem, as it would surround Jerusalem on three sides, if not completely divide the city. “Last week Netanyahu looked the President in the eye and said no,” Tauber said. “Shamir did it to President Bush and Menachem Begin did it to Ronald Reagan many times. People say, sometimes they complain from the right, that it takes the Likud to make peace. But it’s also true that it takes the Likud to say no. The tour was led by tour guides from Keep Jerusalem, a non-profit organization that gives tours of eastern Jerusalem with an aim to educate people on the need to keep Jerusalem united.